Many readers of this blog will be well aware of the challenge that our obesity epidemic poses - the damaging impact on our health and our health services is clear. But just identifying the scale of the problem will only take us so far, so what can be done? 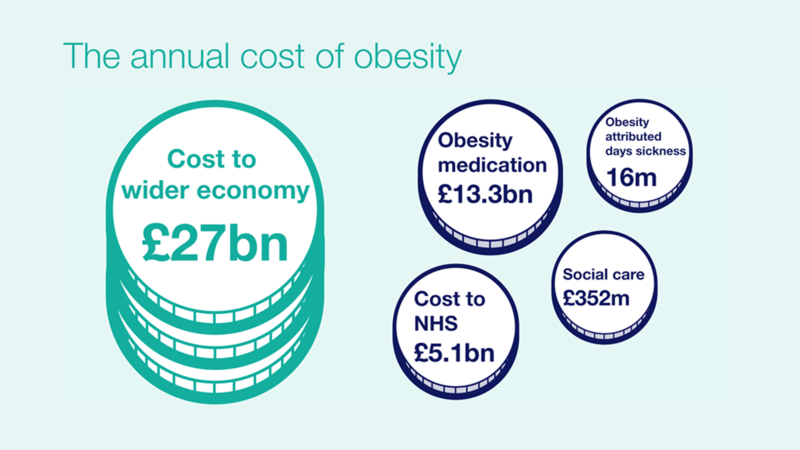 Firstly we have to recognise that current approaches are not making enough impact and with obesity costing the economy £27bn a year we simply can’t afford the status quo. Secondly let’s acknowledge that the causes of obesity are incredibly complex and that limited or short term solutions will only scratch the surface. There is a now a broad consensus that obesity is the result of a large number of factors, activities and determinants. So what if we could develop an approach to obesity that made a real difference? What would it look like? What sort of approaches and interventions would be included? Who would be involved? Could it be rolled out across the UK but still meet specific local needs? And of course, could it be cost effective? There's no point in championing an approach that nobody can afford to implement or that demonstrates no return on investment. As of October this year PHE, the Local Government Association and the Association of Directors of Public Health have entered into a partnership with Leeds Beckett University with a view to designing local whole systems approaches to assist in preventing and tackling obesity. The “whole system” really does influence obesity. Of course we’ll continue to encourage individuals to make healthier choices through campaigns like Change4Life but what about local decisions on anything from the location of fast food outlets or the cost of leisure facilities to the creation of safer cycle routes? And crucially how do the important factors of leadership, collaborative learning and decision making connect with these plans and policies in each locality? 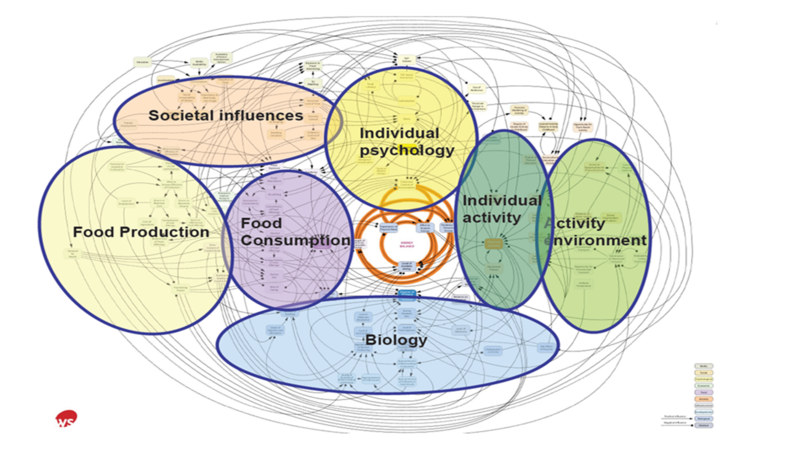 Above: Foresight in its ‘Tackling obesities: future choices’ report outlined that the underlying environmental and behavioural drivers perpetuating obesity exist in a complex and multifaceted system. In recent years many organisations have worked to ensure their strategic decisions are viewed through an environmental sustainability lens, but what about an obesity lens? Can communities, public health, local authorities, the NHS, the voluntary sector and a range of other partners work together to make this happen? PHE, the Local Government Association, the Association for Directors of Public Health and Leeds Beckett University are keen to seize the opportunity to work with local authorities and other partners to help answer these questions. We will do this by reviewing the evidence, exploring what’s happening on the ground and collaborating with up to four local authority areas across England to co-design approaches to pilot. Explaining the system that influences obesity is a key part of this, then looking at the local levers available to create preventative approaches and make change happen. Across the country there are already approaches in place to tackle obesity and our programme of work will look to build on these examples. 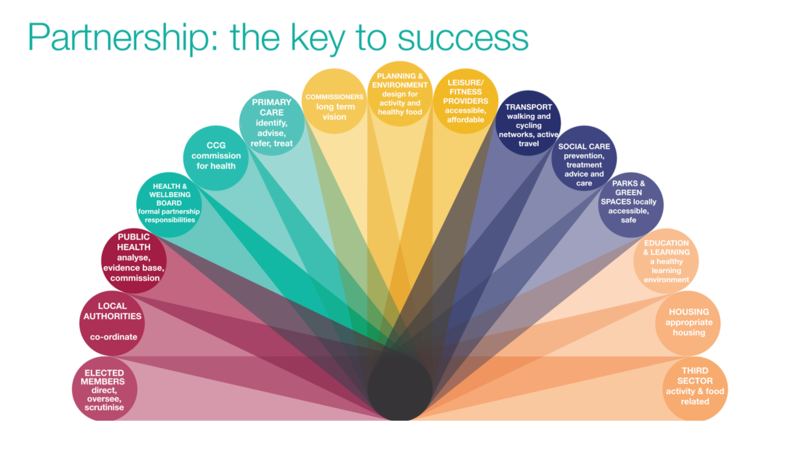 A whole systems approach brings existing prevention approaches together, embeds leadership and makes decisions count, whether they are about planning, lifestyle services or housing. It’s fully acknowledged that the package developed will need to be owned at local level, be flexible, transferable, agile and affordable and address local health inequalities. And we hope delivering the approach will facilitate changes to the way organisations plan and deliver sustained action to help prevent obesity. Key to this journey is sharing our learning throughout the process and importantly to listen and learn from the experiences of those delivering at a local level. The end goal is to inform the viability of a whole systems approach. And it goes without saying that we are hoping the realisation of this work will take us a step further towards putting in place tong term plans to tackling the obesity epidemic. Working and learning together through this systems wide programme, it is possible to make a difference. By doing so we can contribute towards helping local authorities and their communities design long term plans that make the healthier choices the easiest choices whether at home, work or play. For the programme we are seeking local authorities to collaborate in planning and piloting the resulting framework for action on obesity. PHE, the Local Government Association, the Association for Directors of Public Health and Leeds Beckett University will be sending a joint letter to all local authorities in due course inviting them to take part in this programme and complete an expression of interest form. One of the most effective means of both preventing and tackling obesity is by encouraging physical activity as part of people's everyday lives. This country has a wealth of public rights of way, greenways, country parks and informal open spaces, both within and close to most of our towns and cities. Unfortunately, due to a dearth of joined up decision making, both in central and local government; the staffing, care and maintenance of such multi-beneficial facilities has been trashed over the last 5 years or more. In local authorities, there is often a failure of joined up policy and corporate strategic vision over these matters. The Strategic Director of Regeneration, for example, may hold the view that "we're not spending money on public rights of way, when we can't maintain the roads as we would wish". Thus completely ignoring the wider health agenda and the significant impact of the cuts they propose forcing through. There's a need for a lot more joined up thinking about obesity and ensuring that decision makers who are not from a health background have no option but to demonstrate their active commitment. Constantly encouraging incidental physical activity through environmental nudges has a solid evidence base ( http://tinyurl.com/zm9jcwl ) and should be part of any strategy. Active transport is clearly important but need to balance with indoor interventions as 90% of sedentary time is accumulated indoors - mostly offices. The evidence for a plant based diet is strong. The eat well plate has gone further to make this point but not quite far enough. I'm guessing the meat, dairy and egg industry will always have enough money to influence the messages put out there. It's about time that we put health first and stopped the pharmaceutical and food industry giants (and politicians with vested interests) getting so rich.